"In the past people trusted that companies had the best interest of the environment, the ecosystem, human health, but that benevolence is lost," said moderator Han Chen, CEO of biotech startup ZeaKal. "Why do you think we lost that? And how do you think we can restore it?" The answers varied from getting more people interested in science to focusing on the positives of GMO. After the discussion panelist Anthony Zolezzi told St. Louis Public Radio that talking about science will have little impact on people’s feelings about biotechnology. An investor in the organic industry, Zolezzi said the way to change minds is to change the conversation. "Every word that comes along biotech should be 'for mankind,' 'for the benefit of humans,' 'for the next three billion,'" he said. 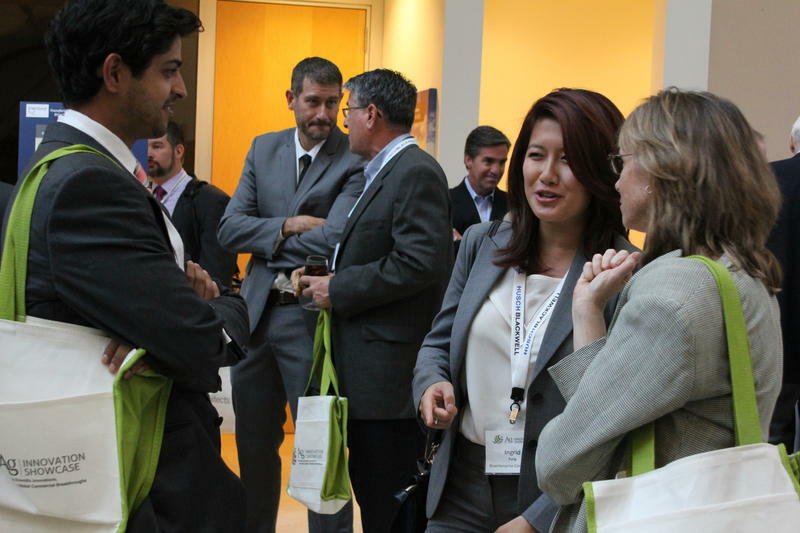 That three billion figure came up a lot at the Ag Innovation Showcase. Scientists estimate the world’s population will grow with an additional 3 billion by 2050. In order to feed that many people, panelist Geoff Kneen, an R&D manager at Bayer CropScience, said technology must stop being demonized. "I think we need to recognize what we’ve experienced in the past and stand up for the benefits of these technologies in the future," Kneen said. Things are evolving quickly in agricultural science. At Monsanto, the seed giant just across the street from the Donald Danforth Plant Science Center, the company’s newest platform includes something called microbials. 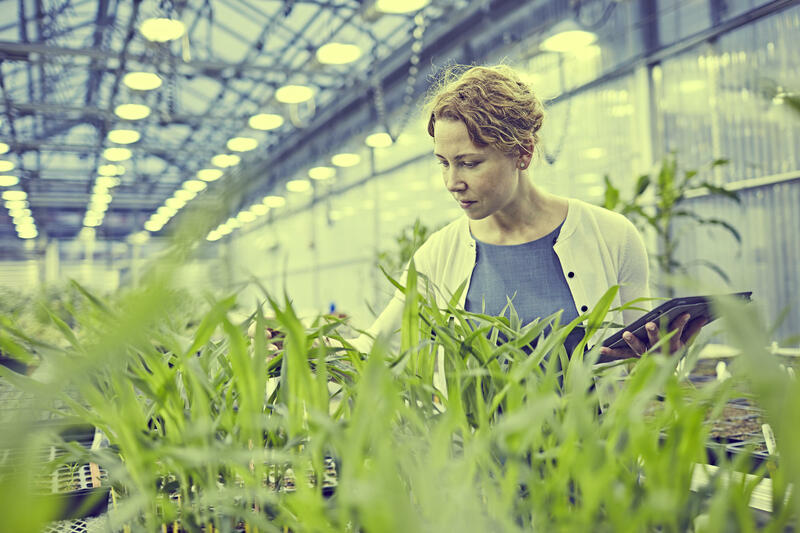 "The soil environment around a plant is already teaming with microbes," said Steve Padgette, vice president of R&D Investment Strategy at Monsanto. Those microbes already are helping plants fend off things like fungus and bacteria. Monsanto formed the BioAg Alliance with Danish company Novozymes in 2014 to begin selling microbe-coated seeds. "What we’re trying do is understand the plants and the soil environment well enough so that we could augment the natural population of microbes with additional microbes to help the plant grow better and ultimately give better yield," he said. Padgette said what are known as biologicals in the ag industry brought in about $2.9 billion globally in 2014. He said about two-thirds of that came from microbials, but another important area within biologicals is RNA technology. The technology makes use of RNA interference, also called RNAi. It’s a biological process where RNA molecules inhibit gene expression. The goal is to allow farmers to apply RNA directly onto crops to help prevent pests and disease. St. Louis-based start-up Apse is working on how to make topical RNA application less expensive and more effective. CEO John Killmer said the new technology is still a few years from market. But so far, he says it’s being embraced even in the organic farming world. "Suppliers to the organic farming industry call me and say 'What are you waiting for? When are you going to come out with this?'" Killmer said, "... because they’re enamored with the non-GMO component of this." Killmer spent several years with Monsanto, including five years as president of Monsanto China. He said the current reception to RNA technology doesn’t mean there won’t be a backlash in the future. "It’s non-GMO technology, it has nothing to do with genetic modification, but the actual facts of the situation sometimes aren’t as important as the emotion and perception," he said. The emotional reaction to GMOs is something Jim Carrington sees as unfortunate but understandable. The president of the Donald Danforth Plant Science Center, Carrington said it’s not just a GMO issue. "Food is a very emotional, very sensitive issue for much of our population," he said. "When you have new technology it can be scary because it’s not well understood by most people." He said GMOs remain a part of the solution for sustainable agriculture, especially because alternatives aren’t always available. But as a plant scientist himself, Carrington is especially excited about the new technologies that are based on how nature controls pests and disease. "In agriculture we’ve tipped the balance a little off of what nature has provided us in the past," he said. "With the biologicals and RNA and taking advantage of natural mechanisms through science, the goal is to introgress a little bit more nature back but retain productivity." Productivity, of course, is key as plant scientists try to figure out how to feed an additional three billion people. Sen. Claire McCaskill is embarking this week on an agricultural tour of the state. The Missouri Democrat began Monday with a stop at the Danforth Plant Science Center, a non-profit research institute, in suburban St. Louis. The center’s campus also includes the Bio Research & Development Growth Park (BRDG Park), an incubator that houses and helps develop life science startups. 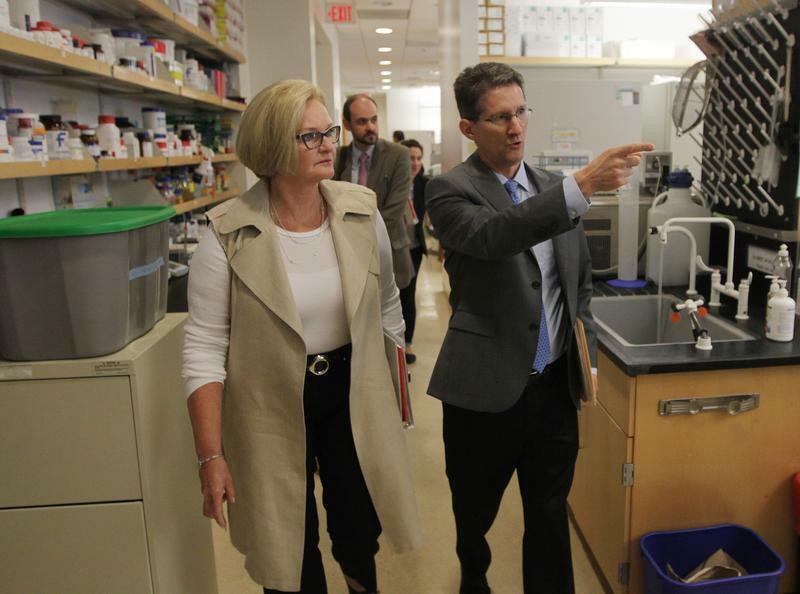 After touring the facility, McCaskill said such research is key to the future of agriculture. Twenty years ago, less than 10 percent of corn and soybean acres in the United States were planted with genetically engineered seeds, the type of biotechnology now commonly known as GMOs. Farmers have rushed to adopt the engineered seeds since then, in part because of climate change concerns.